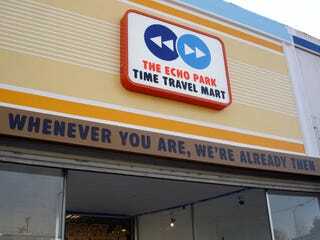 Eco Park Time Travel Mart: "Whenever You Are, We're Already Then"
David Eggers can now add time travel entrepreneur to his long list of literary and social accomplishments thanks to the Eco Park Time Travel Mart he recently opened in LA. Some of the humorous products available for purchase include: mammoth chunks, barbarian repellent, packets of shade and anti-robot fluid. More info after the break.